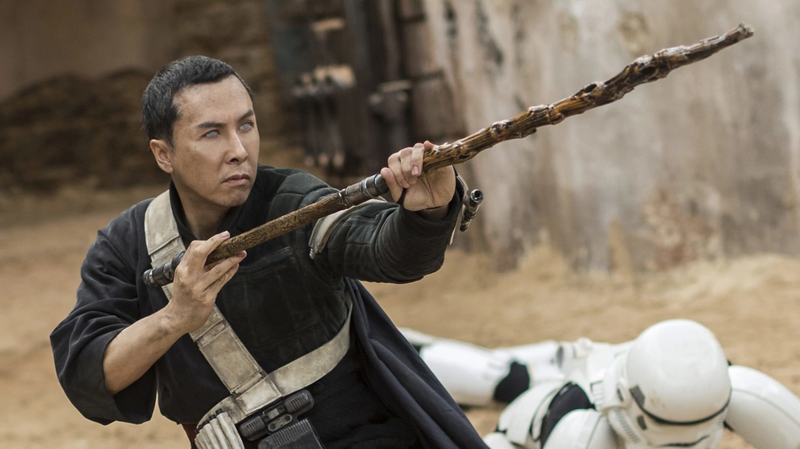 Chirrut Imwe, played by Donnie Yen. China is an increasingly essential part of the global film market, and cracking into success there is a venture that any Hollywood film franchise needs to take seriously. Star Wars has not done exceptionally well, and Donnie Yen, who was in Star Wars himself, has some thoughts as to why. In a recent interview with film site JoBlo, Yen was asked about the fate of the Star Wars franchise in China, which has fared, on average, much, much worse there than in other major marketplaces. According to Yen, the problem is a mixture of cultural cache and narrative and stylistic accessibility. Star Wars, for the unititated, is hard to understand—why would I care about the Skywalker Saga, or the Jedi, without the built in cultural legacy of knowledge that the series’ success in has brought? It’s an interesting challenge to the way these films are made, as Star Wars is, well, pretty fundamentally serialized, relying on narrative connection and a certain level of functional space opera knowledge on the audience. Without that, does Star Wars work? My friends who never managed to get into the juggernaut would tell me, no, no it does not. It’s also, Yen said, a matter of taste and regional style, and Western filmmakers not taking an interest in what works in foreign markets. Which can lead to some odd complications. If this sort of trend continues, then we might see a slow transformation of the Hollywood style, as the West adapts to the demands of foreign markets to try to get better sales. At least the MCU doesn’t have anything to worry about. It works everywhere, apparently.